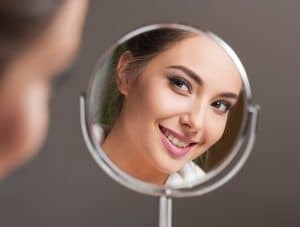 Do you feel embarrassed showing off your teeth, because of a variety of noticeable imperfections? If so, what has stopped you from seeking cosmetic dental treatment in the past? Are you worried about the results looking unnatural, or concerned about the cost? Maybe you’ve been wondering how long the enhancements would actually last? Porcelain veneers are one comprehensive and effective way for dentists to create natural-looking smile enhancements, so if you want to hide imperfections, and simply enjoy a more beautiful smile, porcelain veneers could likely help! Are You Tired of Struggling with Imperfections? Whether you are embarrassed by deep stains or permanent discoloration of your teeth, or inconsistencies in the size or shape of your teeth, porcelain veneers could likely be a great solution. Veneers can be custom-crafted to hide a whole host of imperfections, while also enhancing a smile’s natural beauty. In fact, in some cases, veneers can even be used to help hide minor gaps between some of the teeth. That is so long as the alignment issues are purely cosmetic in nature, and don’t pose functional problems for the smile. Perhaps best of all, because of the customizability of dental porcelain, veneers can be crafted to look natural. This allows for great confidence, knowing people will see your beautiful smile rather than obvious cosmetic dental work. The strength and stain resistant properties of dental porcelain also allow for long-lasting enhancements. In fact, many patients can enjoy their veneers for more than ten years, with proper preventive care. Cosmetic dentistry can help to address most dental imperfections, and with beautiful and natural-looking results. You can schedule a cosmetic consultation with Dr. Steven Huffstutler in Ft. Worth, TX, today by calling 817-577-1444.